A little over a week ago we tested out non-slip scatter rugs to minimize our kids wiping out on the kitchen floor. It wasn't so much an issue with Coco and Sophie as it was with Lobo. Our 3-legged boy, with limited mobility with his single hind leg, was wiping out quite a bit as of late. The scatter rugs proved to be a huge success. Now, it was time to solve the problem in its entirety. We had 2 choices. Purchase a large rug for the center of the kitchen that would cover most of the linoleum floor or strategically place a couple of non-slip carpet runners. We discussed this in great length over dinner and agreed we'd make a final decision at the store. I had no idea choosing a carpet for the kitchen would be a lengthy process. We found a few large carpets that would cover most of the kitchen floor, however, there was one issue...removing the carpet when it was time to sweep and mop. With 3 fur-kids, the option to sweep and mop around the carpet wouldn't work. I sweep daily. I mop the floor once or twice a week. Removing the carpet would require me to move the chairs and table into the other room. Not. Going. To. Happen. We have an eat-in kitchen. Our next option...long, non-slip runners. None of the selection matched the non-slip scatter rugs we picked up for our trial run. Not even close. Our goal wasn't to color coordinate. We embrace mixed-match. Wabi Sabi. We chose 2 long, striped non-slip runners. Once home, and after the Welcome Home Doggie Dance, we strategically placed the runners and existing throw rugs on the floor. Sniff test. Sit. Stretch out. Lobo immediately started running back and forth from the bedroom, through the kitchen, to the living room. Coco and Sophie followed suit. This went on for the remainder of the night. Our kitchen floor now resembles a patchwork quilt. We're okay with that. 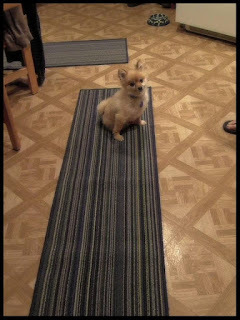 We still need to pick up a couple more non-slip scatter rugs. We already made the decision to pick out clashing colors and prints. Why not, right?